As India celebrates her 72nd Independence Day, television channels, social media platforms, and brands of various hues are keeping consumers engaged with different initiatives. Whether it is movie premieres, back-to-back episodes of popular shows, sales and offers – the engagement is varied. 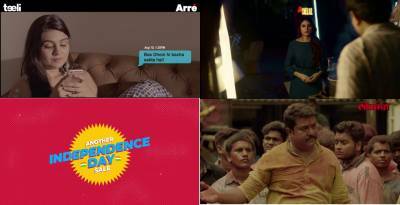 India’s leading digital platform Arré has collaborated with Pakistan’s premier digital entertainment brand Teeli to co-produce, co-write, and co-create the first digital short filmed across Delhi and Karachi, to celebrate Independence Day for India on the 15th of August and for Pakistan, on the 14th of August. The short film explores the possibility of a personal relationship between young people in these two countries and tries to ask the question: What would happen if one of us got a chance to befriend someone across the border? Would the countries’ political and social history come in the way? Is the sarhad more than just a geographical construct demarcating territory? Cleartrip, a leading global online platform for travel and leisure experiences, is organising a first-of-its-kind Digital Travel Meet-up this Independence Day. The event will feature five prominent travel writers and influencers, talk about their personal solo travel experiences in a special AMA (Ask Me Anything) session to be hosted on Twitter. Solo travel has been one trend that has seen a meteoric rise over the past couple of years, as an increasing number of Indians, including a considerable number of women, are joining the solo travel bandwagon. On Cleartrip, bookings for solo travel bookings in the domestic segment rose considerably by 19% year-on-year (YOY) in 2018, with the trend showing no signs of stopping. Solo bookings for people travelling from one tier-1 city to another accounted for 51% of the total bookings. At the same time, solo bookings from tier-2 cities also rose by 42% on the platform. The top domestic destinations for solo bookings on the platform included Goa, Pune, Jaipur, Bhubaneswar, and Srinagar. After seventy-two years of claiming sovereignty from foreign capitalism, independence from corruption and other social issues is still a myth in our country. To stir conversations around them, this Independence Day, Inshorts has rolled out its latest digital campaign #MakeAChange. Built on the insight of first acknowledging the existence of issues and then contemplating to resolve them right from the grassroots level, the creatives showcase five important issues that India is grappling with currently and can be solved in an individual capacity. Starting from illiteracy and pollution, to hunger clean water shortage and bribery and corruption; the #MakeAChange campaign aims to distribute thought provoking creatives so as to make more people feel responsible for this change. #MakeAChange campaign is live from August 10 to August 15, 2018. The campaign has received more than 1.2 lakh pledges pan-India and expects at least 2 lakh pledges by the end of the campaign. The total numbers of pledges taken by the users are displayed live on the App. To commemorate the sacrifices of those brave soldiers and martyrs on whose sacrifices the nation’s freedom is built, News18 India will present a special show – Ye Jo Desh Hai Mera. The special show will feature CRPF personnel who, along with well-known Hasya Kavis, will celebrate India's 72nd Independence Day in a unique style. While the Kavis will recite poems and satirical verses on independence, bravery, battles and sacrifices, the viewers will also witness soldiers unwinding and showcasing their own poetic and artistic talents. Catch Ye Jo Desh Hai Mera on 15th August at 11 AM only on News18 India. This Independence Day as a special movie premiere, Kaali will be aired for the first time on Vijay TV. The movie stars Vijay Antony in the lead alongside Actress Anjali and Sunaina. The movie is directed by Krithika Udhayanidhi. The movie is premiered at 12 pm. So, don’t miss it. One of most expected movie of this year is Kolamavu Kokila (COCO). The movie stars Actress Nayanthara in the lead, the songs have already become a hit. Now the lead Nayanthara, Music director Anirudh Ravinchandar and Director Nelson will join us on a fun chat show. Don’t miss the COCO SPL at 3 P.M. and enjoy your holiday with this exciting line up of programs. This Independence Day, book your tickets on BookMyShow for the Akshay Kumar starrer “Gold” which covers Balbir Singh’s triumphant journey that helped India to win the 1st ever gold medal for Hockey at the Olympics. BookMyShow, being the preferred platform for millions of users across the country to book tickets for their various entertainment needs, has also released a humorous take on the plethora of discounts and promotion led advertisements that usually release around Independence Day. It is our right to choose either ‘good’ or ‘bad’, but it is our duty to always choose ‘good’. After 72 years of independence, does every one of us feel equally independent and safe? What does a woman feel, when she is stuck in an isolated spot during the night? Be it morning or night, regardless of who we are, it is our duty to provide everyone with a safe and secure environment. Sony BBC Earth, the #1 Factual Entertainment Channel, will celebrate the spirit of India with shows such as Tuning 2 U: India’s Lost Musicians, Stairway to Heaven and Joanna Lumely’s India, starting 11am onwards. AXN, the leading English entertainment channel will air the all the seasons of the popular show, The Brave, starting 9am onwards. This Independence Day Star Sports magnifies India’s ‘shock and awe’ impact in the world of sports through the lens of a diverse line-up of exclusive programs. The exclusive sports programming broadcast which starts from 8 AM will feature India’s glorious moments across multiple sports over the ages, with stories of sporting renown specially curated for viewers. The all-day programming line-up will extend across channels - SS1, SS1 HD, SS1 Hindi, SS1 Hindi HD, SS2, SS2 HD and SS First, and would encompass all sports, adding to the patriotic sentiment that is rampant throughout the country on this day. Winning the Cup 2011 – The program is set to take sports fans back in time to the ICC World Cup where India surpassed all odds to lift the coveted title as champions. India became the first country to win the Cricket World Cup on home soil. Hindustan Zindabad – Relive all of India’s wins against historic rivals – Pakistan in the previous iconic matches. Best of Asia Cup – The program offers fan a high-octane countdown of India’s best moments from previous Asia Cups. Sporting moments of Pride (विजय पथ) – The program celebrates India’s greatest sporting moments, that redefined sports history for the country across sports, post-independence. Empire of Cricket – Indulge in India’s illustrious cricket journey, as we celebrate the country’s heady rise in the sport in this exclusive documentary. Winning the Cup 1983 – Experience India’s historic win over West Indies in 1983 as they lifted the coveted Prudential Cup as champions. It was the first ever world cup win for India. Road to Glory 2007 – Revisit India’s triumph in the inaugural ICC World Twenty20 in 2007, and recount the journey that heralded a new dawn in international cricket. Yashasvi Bhava (यशस्वी भव:) – Be a part of Yashasvi Jaiswals journey, the journey of how a young boy from a small town in Uttar Pradesh, is realizing his dream, through hard work and belief in himself. Sports in turmoil zone (खेल जिंदगी है) – Celebrate athletes that hail from conflict zones across the country as they make their resounding mark in the world of sports. Legends – A half hour special interview series that celebrates the sporting journeys of some of the most admired and revered heroes of India. A 9 part series on a single platform primetime to honour and salute sport personalities, their achievements and their undying spirit. From Balbir Singh to Sachin Tendulkar, from Rajyavardhan Singh Rathore to Anil Kumble, Leander Paes, Sourav Ganguly, Vishwanathan Anand, VVS Laxman & PT Usha, are among the celebrated personalities. Tune in to the Star Sports Network on 15th of August 2018, 8 AM onwards on SS1, SS1 HD, SS1 Hindi, SS1 Hindi HD, SS2, SS2 HD and SS First. Moments of Freedom and Independence are not only experienced but also cherished. Not only do they create nostalgia but also reignite a sense of patriotism in every individual. Reveling in this thought, Tide India celebrates the spirit of Independence Day with a video that highlights some of the proudest and Brightest moments India has witnessed in last 71 years of freedom. This video will also be the launch of Tide India’s digital presence on social media. With this campaign, #TideWhite takes immense pride in celebrating the success of India while highlighting the brightest moments of Independent India! Conceptualized by Social Kinnect, the video salutes the country and its people and promises to continue making India brighter everyday in its own way. As an extension to the campaign, the brand will also connect with its digital audience by encouraging consumers to share back their #TideWhite moments through the past 71 years by posting their #TideWhite moments and tagging Tide India on Facebook, Twitter and Instagram. Talking about the core idea of freedom, this Independence Day, we tell our audience to be the change, be bold and express their style freely because they have the freedom they need to do it. At the helm of our independence is our army, protecting the nation at the borders. Similarly, Godrej Home Security Solutions protects our home against all odds. We deal with a lot of problems on the Indian roads majorly due to bad driving, road conditions, traffic and even the people sometimes. If the cars/bikes are not equipped with proper tyres or devices there could be accidents. On the occasion of Independence Day, CEAT will talk about these road problems and provides a solution to these problems with their various product offerings. We need to connect Independence day to our ongoing brand campaign ‘Our Bathroom Has Superpowers. How about yours?’ which says that our bathroom products have superpowers that will make your experience change for better. Our idea is to showcase our brand face i.e the American Standard family image with our hero product, bringing out the theme of the campaign in respect to the Independence Day. Our bathroom superpowers provide you freedom from bathroom hassle.